You may venture off the grid, but you’re never out of reach – as long as you’re carrying an inReach SE+ or inReach Explorer+. These handheld satellite communicators are designed for the outdoor enthusiast who wants to roam farther and experience more – without compromising their loved ones‘ peace of mind. 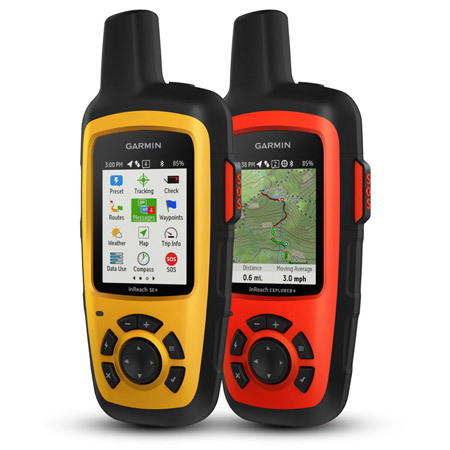 From backcountry experiences to international adventures, inReach provides communication, location sharing, navigation and critical SOS functions for anyone who loves getting away from it all, on land, water, or in the skies. The inReach SE+ and Explorer+ give you all the tools to stay totally connected. You don’t have to worry about being within range of a cell tower – or encountering spotty coverage in fringe zones or blackout areas. Your inReach communicator works anywhere and everywhere – so you’re never out of range, never out of reach. Tough, durable, impact resistant and water-rated to IPX7, the inReach SE+ and inReach Explorer+ handhelds are built to keep you up and running – no matter what the elements throw at you. An internal, rechargeable lithium battery comes standard on both units so you can count on long battery life in every mode of operation (up to 100 hours at 10-minute tracking mode (default); up to 75 hours at 10-minute tracking with 1-second logging; up to 30 days at the 30-minute interval power save mode; and up to 3 years when powered off). Recharge via the standard microUSB power cable or optional in-vehicle 12 V charger.